ISKCON’s community organization is best understood as a series of concentric circles, with the temple at the absolute center. Radiating out from the temple with increasing metaphoric distance are full-time residents of temples, ISKCON-initiated congregational members, non-initiated congregational members, and frequent visitors. Though ISKCON’s temples undoubtedly serve as ceremonial and ritual centers for the movement, they also function as the center of community organization. With few exceptions, members of the International Society for Krishna Consciousness live within easy driving distance of a temple, and have chosen to do so intentionally. The movement operates over three hundred temples, spread over every continent except Antarctica, and in most major cities around the globe. It also operates several dozen farming communities and rural communes, which generally function as temple equivalents for purposes of community organization. For a full list of International Society for Krishna Consciousness centres worldwide click here. Through legal documents, training, and discourse, Srila Prabhupada clearly identified the GBC as the highest managerial body in ISKCON. 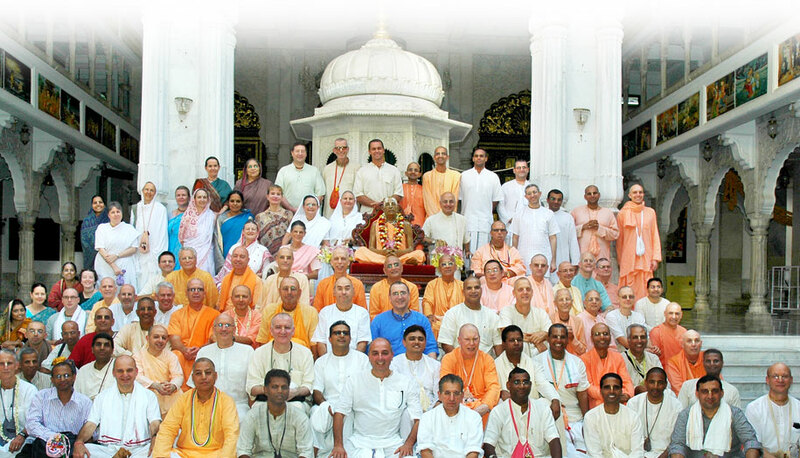 At present, the GBC body is comprised of thirty-two members who are individually responsible for overseeing the management and spiritual standards of ISKCON centers in assigned geographic regions. GBC members also supervise specific projects, initiatives, and ministries. Following the instructions of Srila Prabhupada, the GBC body convenes yearly in Mayapur, West Bengal for their Annual General Meeting, during which time they discuss proposals, specific issues and projects within ISKCON, and pass resolutions by way of a voting process.